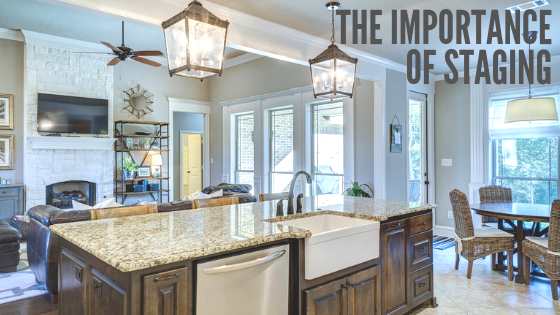 Many people wonder why staging a home is so important when they are thinking about selling it. Have you ever scrolled through homes listed on the various real estate websites and see how gorgeous and pristine they look? You can bet that a family with children does not live like this from day-to-day. Most likely, they have had it thoroughly cleaned and staged to look beautiful both on film and in real life. Your home may be meticulously maintained and well appointed. But keep in mind, your interior design may be suitable for you, but not for everyone. You want to show off the best of your home. Consider that the buyer is making one of the biggest investments of their lives. Showing off all the best attributes of your house can help make them feel at home. Here are some tips on helping to show the best of your home to potential buyers whether or not you use a professional stager. Detach yourself emotionally from your style and your clutter. Our homes represent who we are. Our cherished family memories have been built here and they are on display. Our homes convey our values and beliefs. We must remember, however, that the home needs to speak to people from all walks of life. They all need to feel comfortable when they come in. Now that you are no longer looking at staging as a personal vendetta against your ability to decorate your home, it’s time to declutter. Prized collections may have special meaning to you, but perhaps not your buyer. China cabinets that are overstuffed, bookcases that are overflowing can sidetrack buyers from the beauty that is your home. Clutter can also demonstrate that your home does not have enough room/storage which can be a big drawback. Keep in mind, it’s also a way to protect your most valued belongings. Think about your furnishings. Do you have too many pieces in your living room creating a more cramped atmosphere? Consider removing some pieces or rearranging them in order to make the room feel larger. If you have converted the dining room into an office, you may want to turn it back into the dining room. People don’t want to see office furniture where they would be eating. The same holds true for spare rooms where clutter can collect. Statement pieces may also need a new look. Throw rugs that are dated or styled, large centerpieces, and certain pieces of art may need to be removed and stored. Organize your closets to show maximum space. If you have drawers and shelves in the closet, organize them as well. Buyers tend to look there. If there are necessary repairs that you have left for a rainy day, now is the time to make them so that buyers don’t have to add that to their list of expenses. Make sure your rooms smell good. Cooking odors or musty smells will definitely be a turn off to potential buyers. Finally, think about the wall paint. Too many vibrant colors can be a distraction. Neutral colors in greys or whites are always a safe bet. Consider your curb appeal. Removing any dead plantings and repairing walkways could be on your list. Make sure any outside decor such as planters, wreaths, and lights reflect the current season. Try to make your entrance as inviting as possible. Clean the doors or add a fresh coat of paint should it be needed. Remove cobwebs and insects. You may want to power wash if you have the time. Remember to be sure your address numbers are visible to the street. Finally, consider buying a new welcome mat. Spend time cleaning your kitchen and bathrooms. Be sure they are pristine as these are huge selling points. Put your collection of perfume bottles and high-end moisturizers away. Toaster ovens, coffee makers and utensils should also be stored. Even fruit bowls should be removed from the countertops. Buyers tend to label the homes they see. So consider what you want to be remembered for. The house with a beautiful and welcoming entry or the house with the office in the dining room and the cluttered kitchen. Staging is not meant to expensive and daunting. The best stagers work with what you have. Rearranging or reallocating furnishings, suggestions to lighten and brighten a room and updating your home to maximize its presentation is the ultimate goal.